Thank you for sharing your story! Check your inbox for a instructions on how to send us your picture. She had a dream, but life happened—choices, hurts, disappointments and the mundane. She felt stuck but didn’t want to stay there. So, she sought healing. She found freedom and her identity became clear. 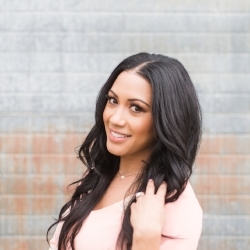 Knowing who she was empowered her to get healthy and discover her purpose. Through gathering with other women, she saw her God-given dream was bigger than her. Understanding who she is on the inside equipped her to express who she is on the outside. She has a desire to move. She is changing seasons of life. She knows there's more in her. She understands she was created for a purpose bigger than herself! I've been successful, now what? I was introduced to Created Woman by my friend, Lynn, who had raved about the community of dreamers and doers and I was excited to be apart of the movement. At first I thought, these are women who are doing big things - running businesses, writing books, speaking at conferences. As an administrative assistant, I felt way out of my league. Once I started participating in the Dream launcher time during Gather Her and sharing my dreams and passions with others who were just taking baby steps like me in discovering our purpose, I realized that I am created for so much more and that I too am a created woman. Created Woman has been a place of nurture and refuge for me. In a world where women are taught to compare and compete, CW has encouraged, empowered and equipped me to walk out purpose. 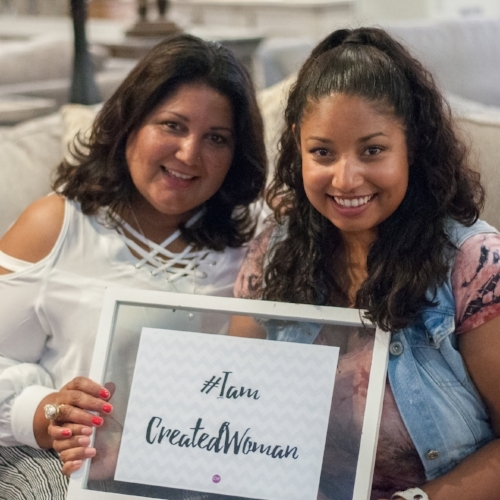 Created Woman is a place where you are welcomed and where you matter! Created Woman has been a place of healing and restoration for me. I found this amazing group of women with a mission that I could connect to on so many levels and in every season of my life. CW has helped me heal through tough moments and brought me joy in the great moments of life all while strengthening my faith in God. I have found a tribe like no other. I am Kristen, and I am Created Woman. "I would always hear, 'You have a God-given purpose in life,' but that was hard for me to believe. I always just labeled myself as a 'single mom.' Nothing more. Then God used Created Woman to nudge me, remind me, of the gift I have, that I was doing nothing with. Now that I am walking in my purpose, others are being blessed!" For as long as I could remember, I have been giving styling advice to friends and family - each time considering the message a recommended outfit would send out to the world. As my fascination with clothing and helping others through clothing increased, I was challenged with questions like: Is this my gift? Can I use this gift to glorify God? Is this 'gift' actually a superficial type of joy? Through prayer, I explored these questions deeper and boy did the Holy Spirit answer! The first answer came through Created Woman where I had the opportunity to assist Heather Frierson with styling her fashion shows at Style Speaks. Next, I was blessed to lead my first fashion show for the women’s group at my local church, GMZ. Soon after, I was introduced to the world of personal styling through Jennifer Young, and truly, it was through personal styling that I could clearly see how to share my God given gift with others. After doing some research, God led me to The Paid Stylist and I took their 8-week business course - Committed. Although the course was a ton of hard work and often forced me to step out of my comfort zone, it equipped me with the knowledge and tools I needed to launch my own personal styling business - Approachable Style by Travis Williams. I'm thrilled to say that my personal styling business will be launching this fall and I can't wait to help women find clothing that expresses the look they want to translate to the world. I have peace and joy knowing that the gift God gave me will be used to help women through those seasons and big moments in life.